If you wend your way up the California coast, midway between Los Angeles and California, you’ll spot signs for San Simeon and it’s main attraction, Hearst Castle, a sprawling, 56-bedroom retreat built in the first half of the 20th century by newspaper magnate William Randolph Hearst. It’s a jaw-droppingly pretty part of the world, but as we traveled the Pacific Coast Highway, we couldn’t help wonder. Could we name a baby boy Simeon? Thanks to Emmy Jo for suggesting today’s Name of the Day. Simeon shares his origins with Simon. Both come from the Hebrew Shimon and mean, roughly “God has listened” or “to hear.” Simeon is favored in the Old Testament and farther East, but Simon holds sway in most of the Western World. Shimon is also common, especially in Israel. While we love Simon, it’s Simeon that has an exotic, shimmering quality. You’re unlikely to hear the name in the US. While it’s been back in the Top 1000 most years since 1996, today it stands at a mere #926. That adds up to less than 2,000 Simeons born in a decade. For comparison’s sake, there were more than 1300 Simons born in 2007 alone. Back in the Old Testament, Simeon was the son of Jacob and Leah and the leader of one of the Twelve Tribes of Israel. In the New Testament, Simeon the Righteous was responsible for blessing Jesus when Mary and Joseph brought him to the Temple in Jerusalem. While Simeon became Simon in most parts of the world, in Bulgaria, the three-syllable version remained in use and Simeon the Great ruled an expanding empire from 893 to 927. A 20th century Simeon would also be named Tsar on the eve of World War II. While the monarchy in Bulgaria is a thing of the past, Tsar Simeon II holds an interesting place in history – he is the only monarch of a nation to go on to serve as Prime Minister. There are a handful of Saint Simeons – hence the place name in California – and the name is scattered throughout the historical record from antiquity to the present. But our best guess is that Simeon has fallen on hard times because of its homophone: simian. That’s right. Simeon is an appealing name for a boy, but Simian refers to monkeys, chiefly the higher primates. Is it a fatal flaw? With daring Biblical names coming back into use – even the mainstream – Simeon might overcome his ape-man overtones. After all, obscure names like Hezekiah and Zechariah now make the Top 1000. And, as we reported in The Softer Side of Boys, Elijah and Isaiah are positively chart-topping. Plus, Simeon’s Eastern pedigree may appeal to parents looking for something that works well in English, but sounds imported. As for the meaning? We’ve screamed from the rooftops that Cason is a lousy baby name because a caisson is an ammunition chest. But Cason and Kason are right there in the Top 1000, rolling along. While connections like these scare us away, plenty of parents feel that there’s a gulf between one spelling and another. If Cason isn’t a destructive force, maybe Simeon doesn’t swing from trees. 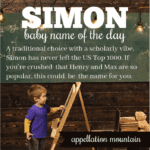 An intrepid baby namer could certainly consider Simeon. Most families that we know would probably name their child Simon – and he’d join big brother Henry at home. But if your tastes run to Gideon and Malachi, this one might sound perfectly reasonable, even tame when compared to Obadiah or other old school possibilities. And don’t get me started on the uber-violent boys’ names! Who calls their kid Decker!? Ooh … Asa and Simeon! Great sibset. Lola, thanks for the Gullah Gullah tip. Simeon Othello – how fabulous! I suppose my hesitation with the monkey thing is deeply personal. As fate would have it, I inherited my father’s fair skin and light eyes, but my mother’s dark, dark hair. Everywhere. Now that I’m a grown-up, I don’t mind looking like the love child of Snow White and the Yeti. But then again, I can trot down to the salon and turn my bushy eyebrows into elegant arches. As a teenager, I used to wear long sleeves in the middle of summer. Yeah, that bad. Had I been born with darker skin or lighter hair, I’m sure I’d barely notice the ape-man vibe and embrace this exotic and daring moniker. I adore Simon, after all. But it’s one of those strikes-a-nerve names for me. Funny! my Simon was almost Simeon *the actual Uncle he was named for’s name) Ultimately, I thought it was a bit too exotic to fit with brother Leo. He’s been pushing it for a possible brother this time. I think he should save it for his own kid. My Simon ‘s nickname (when we use it) is Sam (for his initials) Sam & Sim aren’t too confusing for me, but I still think he’d be better off using it to honor himself without a Jr. I*’d love to but don’t want to almost duplicate one kids name bt not the other (although I could happily name another daughter Leontine despite having a Leo boy). I know a set of young adult musician brothers named Asa and Simeon. Simeon goes by Sim, and is affable and kind-hearted.